A regular on the main tour from 2003/4 to 2008/9, Scott’s best year came during 2006 when he reached the TV stages of both the China Open and the UK Championship. In China he went on his best tournament run to date as he won four qualifying matches to reach the last 32, before seeing off wildcard Li Hang and Matthew Stevens to reach the last 16. His run was to end there though as he lost to another Welshman, eventual tournament winner Mark Williams. At the UK Championship he defeated veteran Dene O’Kane and Leicester’s Tom Ford to reach the final stages in York where he would come up against Nottingham’s Michael Holt in the last 48. Sensationally, Scott not only won the match but did so by a 9-0 margin to set up a tie with reigning world-champion Graeme Dott in the next round that he would go on to lose 9-2. Despite these runs however his ranking was just 60th position and he narrowly avoided relegation from the tour at the end of 2007/8 as he relied on the one-year list to keep his place. The following season was even worse as managing to win just three matches, he finished up ranked 87th and having lost his place on the tour as a result, announced his retirement from the sport. 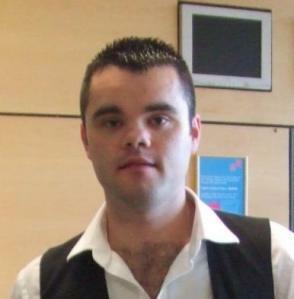 Competing as an amateur however, Scott managed to secure a return to the professional circuit during the 2010/11 season as he performed well enough to earn the Scottish nomination. Scott made a strong start to his tour return in 2011, a last 32 run in the first PTC followed by three wins in the Australian Goldfields Open qualifiers before a 5-2 defeat to Ken Doherty denied him a place at the venue. From there however Scott began to struggle, a 5-0 defeat to Adam Wicheard in his opening match at the Shanghai Masters qualifiers together with a series of early exits in the following PTC events meaning that he would not be in contention for a top 64 place at either of the season’s first two seedings revisions. As was the case with a number of players, following the conclusion of the PTC events, with his relegation from the tour all but confirmed, Scott elected not to enter another event during the course of the season.